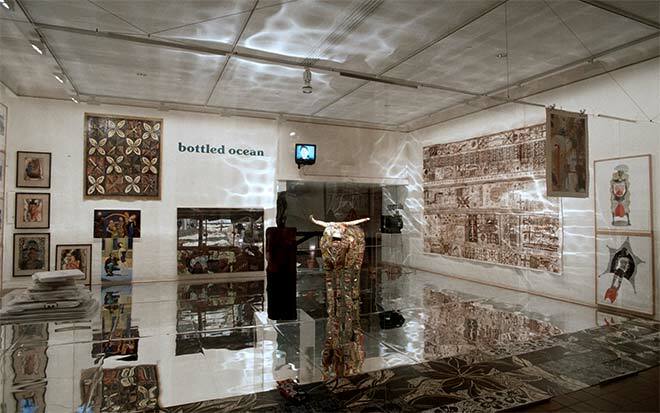 At Wellington’s City Gallery, many of the Bottled Ocean works were displayed in a mirror-bottomed, perspex-fronted cabinet, mimicking museum displays of objects or window displays of department stores. At the Auckland Art Gallery (shown here), some works remained in their cases and others were partly unpacked. The positioning of the art, the lack of labels and the diversity of the work were, said Vivieaere, artificial problems for viewers to actively deal with.